This Old Life: I'm Back, And A Blog Award!! I'm Back, And A Blog Award!! 1. Favorite food: Although handfuls of Almond M&Ms are what get me through the day with my sanity intact (taking care of a two year-old is stressful, okay?! ), I'd say that my favorite food is Thai food, specifically Pad Thai. 2. Favorite Movie: I have so many, mostly because I think that comparing films from different genres is like comparing apples to oranges, so I have a favorite from each! I'll just list a few: favorite classic movie: "Bringing Up Baby"; favorite musical: "1776"; favorite romantic comedy: "French Kiss". My all-time favorite is probably "Far and Away". Any movie that has the words "epic romance" in the trailer is on my list. 4. Favorite Architectural Style: Craftsman. Luckily, I live in my dream house! This is the only picture that I can find of the inside right now, and it's from Christmas (ignore the baby). 5. Favorite Book: Jane Eyre. I also have a secret fondness for trashy romance novels (only the historical ones; that makes them historical fiction, right?! Let's say yes). 6. Favorite. Post. Ever. This Easter one from Debi of my Happy Sewing Place. This might be the funniest thing that I have ever seen. 8. Favorite Singer: Annette Hanshaw. Also Sebastian Bach (Skid Row). I mean, he was on Broadway too, so I don't need to be embarrassed about this one, right?! 10. Favorite Song: "Against All Odds" by Phil Collins. Any song that could be classified as a "power ballad" will definitely be on one of my mix tapes. Oh yes, I still listen to my mix tapes. So, now that you know more about me than you ever wanted to know, I will pass this award on to some other bloggers! 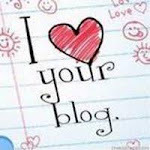 There are so many great blogs out there with fewer than 300 followers; way too many to list here. 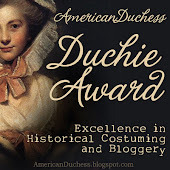 At first, I tried to omit the blogs to which I have given an award previously, but in the process of going over them again, I decided that I just couldn't do it; all of these blogs are great! Thanks again for the award, Lauren! And thanks to all of you for your lovely comments on my (infrequent) posts! I have so many things to show, but I just can't seem to get any good photos of them. I've borrowed my mother's good camera, so if the temperature outside would just fall below 95 degrees, I should be able to get something to show you! Also, welcome to my newest followers: Dakota, The Vintage Knitter, Katia, Spinnakersu, Living Vintage, Linda, Chelsea, Carol, WanderlustPixieDust, Evie Graham, TwilaTee, Jess, Andrea, Lauren, Charlotte, Lisa, Diary of a Vintage Modiste, Anne Toft, GreenPea, Black Opal, K Boulton, Teresa Liao, Temporary Cat, and Chris Simich. Whew!! How can you ignore the baby! Ha ha; I should have said, "Don't let the baby distract you from noticing the architectural details!" He definitely can't be ignored! Congratulations on your Liebster blog award, Nabby and thank you for passing the the award onto me too. Lovely! No need for an apology! I think it just shows that we both have excellent taste! Thanks for the lovely publicity, too. So sorry for the delay in responding I'm struggling to keep up to date with all my blog reading lately! Congratulations the award and a huge Thank you sooo much for passing it on to me you have really made my day!!! Your house looks like my dream home, love that craftsman style!!! And thank you so much for passing it along to me!